Available now from WMG publishing! In the domed cities of the Moon, between human greed and alien laws, between morality and justice, one man stands at the apex between right and wrong. Miles Flint, no stranger to tough cases, walks a razor edge as he and others struggle to save the Moon from total destruction. And in Flint’s world, the truth always comes with consequences. 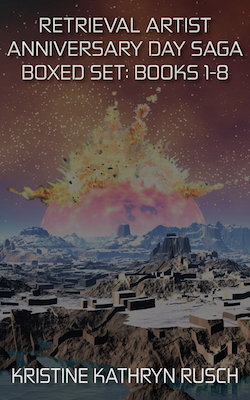 This boxed set contains all of the following novels! Eighteen months ago, I thought the Anniversary Day Saga would never end. I wrote a part of it, finished that, then wrote another part, reassembled the entire story, and wrote yet another part. Eventually I figured out how all the pieces went together. But for someone like me, someone who jumps from project to project, this particular series proved challenging. It took all of my attention and then some. When I finished, I worried how the fans would react to getting six books in six months to read the entire saga. I figured a handful would do that; the rest would either read it all when the saga ended or would buy a book occasionally. I never expected so many of you to follow me, month to month, on this journey. I am happily surprised. 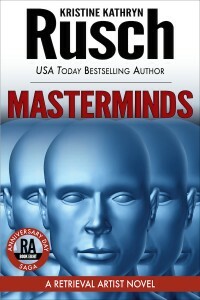 The one-per-month release ends today with the publication of Masterminds. I’m partly relieved that the second phase of this project is over. But I’m also pleased that the third phase can begin. 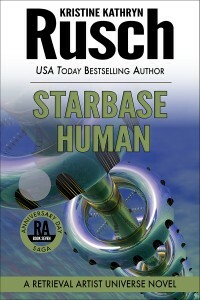 That phase will start in July, when WMG Publishing promotes the entire series as one giant unit. So many of you will already be ahead of that promotion. By July, you will have read or listened to the entire saga. Thank you! I hope you enjoy it. 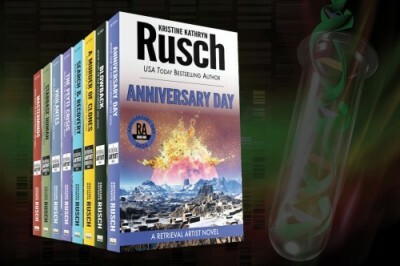 Rusch juggles the ensemble cast and numerous plots skillfully, offering up a cerebral thriller that’s part mystery and part action-drama with a ticking countdown. The human element plays well against the tense atmosphere, and frequent scene shifts help provide a sense of momentum and foreboding. While it’s almost essential to have read the previous installments, this is a very strong payoff for the series. Rusch has attempted an ambitious project, one that succeeds. I think it’s one of the major science fiction stories of the year. Masterminds wraps up the crisis, but it doesn’t end the Retrieval Artist series. Miles Flint will be back, and so will some of your favorites, old and new. I’m not yet sure when the next book will hit print. I’m still recovering from this large saga. But I promise, you’ll be the first to know when it does.